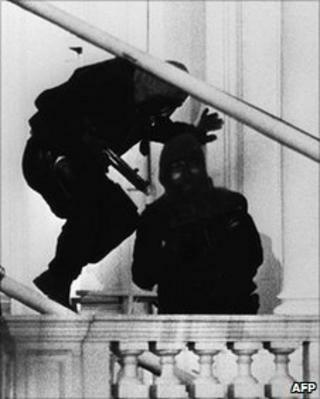 The Foreign Office expected countries to ask for the loan of the SAS in a siege or hijack after the London Iranian Embassy rescue, documents show. Documents from 1980 released by the National Archives reveal a discussion about a legal agreement to cover the use of the SAS by another country. A memo says those countries would have to accept "prior responsibility for any claims for damage or injury". The documents also reveal the government's pride in the SAS mission. The special forces stormed the embassy on 5 May 1980, and within 15 minutes, the six-day siege by six Iranian Arab separatists was over. Five of the gunmen and two of the 26 hostages were killed during the siege. The rescue operation by black-clad figures was watched by millions of people on television and it brought the SAS and its motto - Who Dares Wins - to the world's attention. An internal memo from the FCO's Middle East department, dated 9 May, considers the "future use of SAS anti-terrorist squads". It suggests the successful outcome of the Iranian embassy siege will lead to "a fresh wave of requests for SAS training teams to visit well-disposed Middle Eastern countries". "... we may also get requests in the event of a future hi-jack (sic) or siege involving hostages, for the loan of an SAS team to resolve the problem. If British hostages are involved, ministers may be disposed to agree." It talks of the need for a "proforma agreement" covering such issues as immunity from prosecution and liability. Another internal memo says such an agreement is already in place as part of the "Pulpit plans - military intervention in the event of a terrorist incident overseas". It said there was still an issue with compensation, which would not be a factor if the overseas operation was carried out for the UK's benefit. "If a Pulpit force was sent in at the request of a Government then we probably would insist on that Government accepting prior responsibility for any claims for damage or injury. "If the operation was a success, there would be no problem about payment. But if things went badly it seems doubtful that the Government concerned would pay up willingly and unlikely that we would press them to do so." The newly-released documents show the extent of the government's pride in the SAS operation or "military gymnastics", as it is called in one memo. "Mr Haydon Phillips mentioned at the Home Secretary's party on 8 May that they were considering a grand tour by a joint team to brief friendly countries about the incident and to stress that command and control is as important as the actual military gymnastics. (Perhaps it is only because the SAS are so competent that we can afford to say this)." The successful SAS mission came a month after a covert US military mission failed to free 52 American hostages held at the US embassy in Tehran. Eight soldiers died, and another four men suffered burns, when a helicopter crashed into a transport plane. The hostage ordeal began in November 1979 when a group of radical Iranian students stormed the embassy and the hostages were not freed until January 1981.